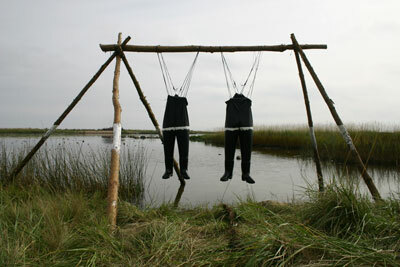 Between 23 August and 5 September 2004, an international art symposium was held in Bergkvara, approximately 45 kilometres south of Kalmar, Sweden. Twelve artists from New Zealand, United Kingdom, Austria, Japan, Denmark and Sweden,were invited to create works of art in a beautiful landscape where the sea meets the land. Bergkvara and the borough of Torsås. The aim was to promote contact between the artists and the general public, to created international contacts for Swedish artists, to strengthen art in the south of Sweden and to allow international contemporary art and Swedish cultural landscape to meet in an exciting way. During the art meeting, the general public was able to view and experience how the individual artist created their particular work of art. Two days of the art meeting were dedicated to open seminars with invited representatives from universities and cultural institutions. 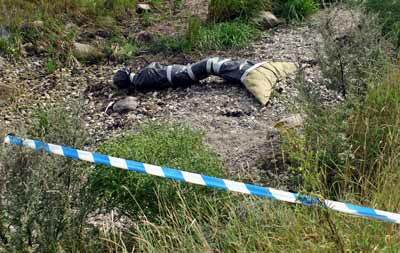 In the village of Bergkvara on the edge of the Baltic sea I find a history that is half buried. Here is a place that it is possible to hide in. The distant past is remembered with great clarity, the more recent past is strangely indistinct, overlooked. I also nearly ignore this almost completely overgrown small hill with two enigmatic steel bound doors. Curious, I begin to ask passers-by, what is this place? 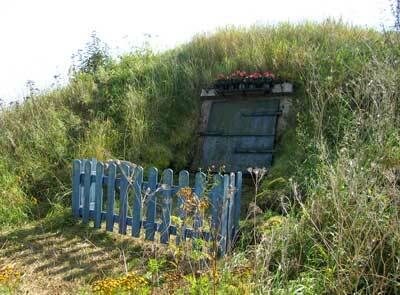 But no two people told me the same story about this underground bunker. The stories I was told ranged from offhand to complex and richly imagined. One gentleman assured me that there were many similar bunkers along the coast and they were related to a paranoid defence against Danish retaliation since 1640. One suggested that perhaps the reason could be found in the first world war, another thought the second war more likely. One person thought it may have had crates of tinned food, guns and socks locked in it, for whose army unclear. Another man I asked imagined with inspired detail that it would have housed an officer with a radio and a roomfull of maps, perhaps machines that go ping, but once again with no clear idea which conflict the maps would have charted. Yet another just wanted to tell me about how he played here as a boy with no thoughts of war, only solitude. To me it doesn’t matter what the factual history may be, if any or none of those stories have truth in them. What did seem important was the layer of willful social and historical forgetfulness and invention that the site was attracting. This social veneer is found in some form everywhere there are people, we all present the best face we can, the face we most want to be like. The picket fence and the begonias in the flower basket represent the desire to look well to our neighbours. They represent the idea of a need for defence against an enemy that is not clearly defined, and also the small fictions we tell ourselves and the occasional curious stranger. History lives here, showing us more than one face. The door is open but there is no gate so you may not enter. I am a sculptor, working in multimedia, site-responsive installation. I am interested in doors and gateways as metaphors for healing and rites of passage. A gateway presents the possibility of change, the passing from one state to another. Once opened, a door exposes a new state that will be part of the consciousness even after turning back and closing the door. So a gateway can be a symbol of change. I wish to refer to human presence, so I use coloured, man-made materials and fabricated objects. This is an attempt to communicate a sense of wonder, transience, human frailty or spirituality. The context of the site is always of utmost importance and is the starting point of an idea. In Bergkvara, I wanted to make an optimistic, even triumphal piece because, recently, I have been through a difficult time. The landscape, with sea on both sides, gave a sense of passage. The delicate beauty of the site allowed me to explore the fragililty and intimacy of nature and my own spirituality. We were working at Vagen, the recycling centre, so I had the opportunity to find interesting rubbish. I wanted to use delicate materials. In a skip, I found the springs of a mattress, runners from a sleigh, and plastic tennis rackets. I made use of the metal workshops at the recycling centre. The arch was formed by cutting a hole, the size and shape of my own body, in the mattress springs. I sprayed the metal parts gold and silver to denote precious metals and special status. The delicacy of the material allows the form to float in its environment, here and not here. The title is in lower case text to refer to a child’s vision of an arc as opposed to the pomposity of a war monument. wishes to forsake their adult scepticism and ‘step through’ to a new way of seeing. This title is not a title in a common sense. It is more like a name, like the name for a child. The form that I have chosen for this special place is a creature. It’s not a human being, not an animal and not a plant. It’s a creature of my imagination with the name of a plant. The blossom of this plant has a connection to the form of my creature. My daughter also has the name of a plant. Her name is Veronika. When I cleaned the place for my installation, I ound a shopping-bag made of plastic, a red one with the word LIN written on one side. My form is a peaceful creature. She is living there between the two walls with a wonderful view of the seaside in her future time. I dont know when she will leave her home. Maybe she will die when she has completed her mission. I don’t wish for someone to destroy her – kill her. 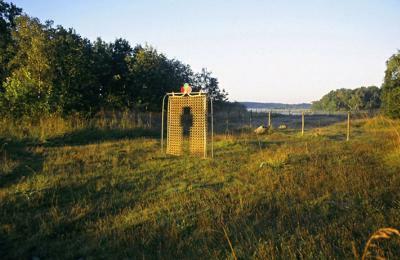 In the past that place was used as a shooting-ground – to practise shooting for killing – people or animals. Some people do it as a sport. A work of art in a public space demands a special relation to the site and to the viewer. In a public space the audience cannot choose to avoid the work of art. “Free Mini-golf” discusses the probable alienation of the work of art in relation to its site and the similarity between the viewer and the tourist when confronting the work of art. When I, as an artist, on a short visit to Bergkvara likened to that of a tourist, produce a work of art on a site I don’t have a relation to, and places the artwork outdoors the artwork itself turn into a kind of visitor or stranger. The audience, in this case the inhabitants of Bergkvara, on the other hand turn into tourists when they view the artwork. The result can only be alienation in the relation between the site, the spectator and the artwork. In “Free Mini-golf” I chose to relate to this alienation. ownership and nationality changes meaning or cease to exist. 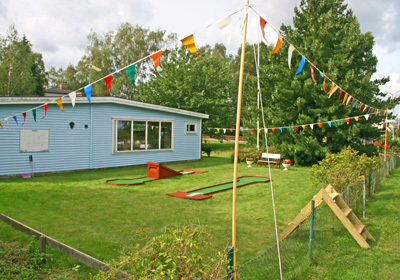 “Free Mini-golf” is constituted by a two-hole mini-golf course situated in a garden in a villa district. Mini-golf is a family sport, an anti elitist game on the border of despised junk culture. It is common everywhere, everybody knows it and it is available to all. A mini-golf course is a public space. The house had been alienated through being left empty for a long period of time and thereby created a kind of free space, belonging to me as much as to the inhabitants of Bergkvara. To place a public work of art in the middle of a villa district was at the same time as absurd as selfevident. A garden is a sort of display area that is disclosed and signals privacy. Through a temporary stairway across the fence, similar to stairways across fences all over the Swedish countryside, an accessibility to, and opening to the garden and the house is created. The audience had to climb over the fence in order to use the piece of art, i.e. to play mini-golf. 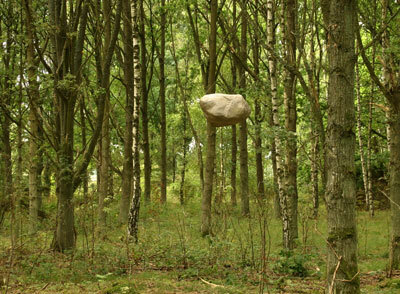 As a finished installation “The Stone Experiment” consisted of two artificial stones. They were made out of chicken wire, and covered by layers of fabric, glue, plastic paint and laquer. 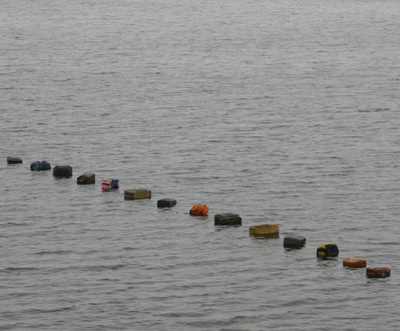 One of the “stones” was filled with polystyrene in order to float and placed on the surface of the water. The other was hanging down from a tree, attached to an invisible wire. Each stone had its own location, and even though they were placed in the same area the connection between them was not evident. artificial stones, with unnatural qualities, in the nature. Instead of trying to copy reality I decided to work with my own inner image of a stone. By using shape and color that made people refer to reality I was able to play with our perceptions of what is possible and what is not. Except for the contrast between the natural and the artificial, the installation also had to do with both acceptance and resistance. To fall, like a hanging stone might, or to float, like the one in the water, could be a way of accepting a situation. At the same time a stone in the air, or a floating one, shows some kind of resistance of the general order. We are all part of the world we live in. 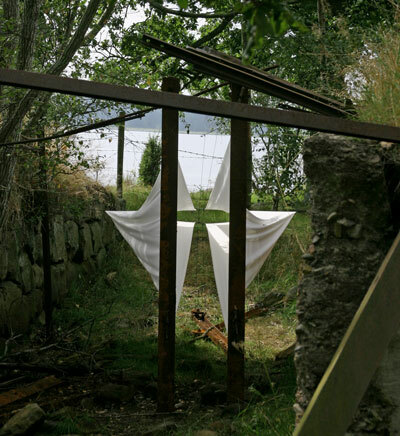 The installation “Exile” is a tribute to those who are forced to leave their home and their cultural connections due to economical, political or religious reasons. All of the world is still overflowing. a small corridor with openings on both sides to the approximate 30-meter high towers. 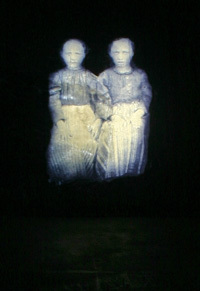 From inside of the silo tower the children gazed down, projected directly on the raw and rough concrete wall. They floated, two and two tightly together, above them compact darkness, acoustics. From a tunnel under the wood floor of the corridor rose sounds, a meditative machine music with distant voices like the murmur of children playing on a beach. The sound rose and got mixed up with the sound of the visitor’s steps and whispers. Echoes! Echoes of feet on wood floor! Echoes of feet who walked before, of them who walked before into the nameless history. AS NATURE DIES, FAIRYTALES AND MYTHS DIE, AND SO DO THE STORIES OF HUMAN LIFE. BE PASSED ON TO THE AUTHORITIES. It challenged me to work so close to the sea and the many meanings that go through your mind when facing the sea; the coast as a boundary between water and land – the coast reminding us of the moment of evolution; the change from life in water to life on land, the coast as a symbol throughout all ages of the destiny of human emigrants then and now. Bergkvara’s specific geological formations show very different characteristics in the rather small stretch of coastline that are connected by few transitional spaces. A small area with a spit of land, with one coast facing east and one coast facing west, one with rocks exposed to and shaped by wind and waves, and the other calm with a lot of vegetation. So, soon I made a decision to connect them with a line to create a relationship between them. Facing the mainland you are also able to see some small islands connected by high grass and reed. 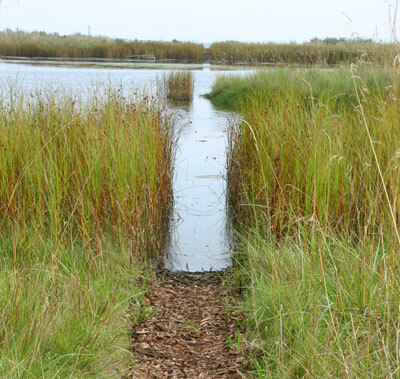 your eyes, cross the water to the next island on to the next passage way, continue to bridge over the next distance of water to reach the mainland and keep your view evenly while proceeding inland. Along this line the path is covered with a carpet of bark mulch. Since the path is pointed rather than precisely from east to west and west to east, you can experience special moments in the morníng as well as in the evening when your own very long shadow can fall on the path in front of you to transform your figure into a vivid symbol. That shadow, becoming a strong image in its natural setting, symbolises the passing of time as well as your own passing through, and passing through time. Opening the coast means opening the mind and making the seaside transparent, including the political dimension of letting people ashore, letting them come in, letting them get out, letting them pass through, from coast to coast, and sending a clear message to them – keep going. 1. ”It came from Outer Space” operates on 3 superior levels – the popular level, illustrated by using the photographic piece as part of the fun of the fair in the beginning of the century – the avantgarde level, in which the artist, by the use of insulating tape in clear primary colours, refers to the paintings of Piet Mondrian made in the 30’s – and finally ties it all together by using a plagiarism of the Swedish national tree – the Birch. the Bell tower as a spaceship – the artist as bearer of the culture, the text about the Metropole as socioeconomic space – and finally the artist as socially engaged factor, illustrated by placing the exhibition in “the blue house”, and thereby reopen a mentally repressed social space. 3. “It came from Outer Space” operates on 3 superior levels – “the foreigner” – our conception of “the foreigner” – and laughter as a way to loosen up the anxiety. 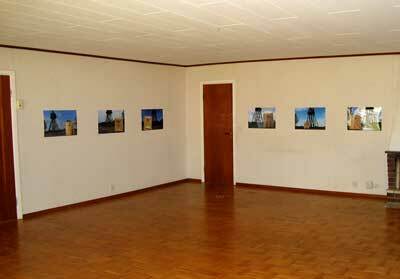 12 photographs of the participating Artists in the Art Meeting 2004 in Bergkvara are exhibited in a particular space. The photographs are taken by the Bell tower in Bergkvara. A rectangle of a Birch tree laminate is produced. In the Plate a hole is carved – so the Artist can put his/her face through it. The Plate is “painted” with isolating tape with paraphrases of figures from“Outer Space”. The Photographs are commented on by small pieces of text. A piece of Birch tree laminate – approx. 120 x 140 cm. To search for a specific space, finding it, definig it, open it up, hearing the sound, connecting soil – sky. The intention of the Art Meeting project was to create a forum, based on international concepts and experiences, for artists from both Sweden and other countries. The focus was on art and culture, internationally, regionally and locally. Konstfrämjandet viewed this project as an opportunity to find its way into new activities relating to art and culture. The project was a collaboration between Konstfrämjandet, the Art Development Officer in the county of Kalmar and Kulturmagasinet. 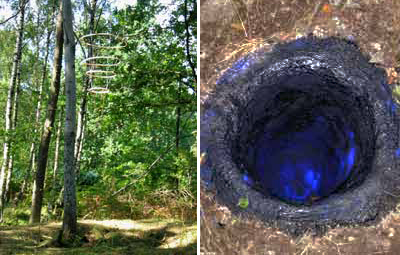 Due to the connection with Kulturmagasinet in Bergkvara and the borough of Torsås during 2004 the project was located to Bergkvara. The invited artists were given the following offer: accommodation, subsistence, paid expenses for materials, paid travel expenses for participants from outside Sweden.